This hut is set amid some rugged country with permanent ice fields around the tops. The steep & often crumbling slopes lead down to swift watercourses that contain some very large boulders. This country is inhabited by strong populations of thar and chamois which attract a regular flow of hunters to Smyth hut. A lot of the hunters fly in rather than walk! 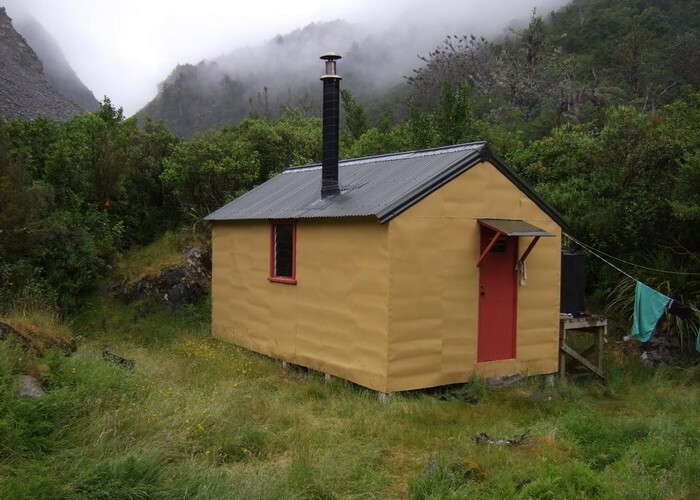 Smyth hut January 2012 • By glennj. Licence: C.
2/ From the Waitaha tributary County Stream. Allow a day to travel between County & Smyth huts. There are two untracked & unmarked routes I know of. See the Permolat County Stream hut page for more details. Added 5 January 2012 by glennjglennj. No revisions.